Managing the homestead while my wife was in Austin | Tales From The Ipe! My wife went to Austin for meetings last week so I took off Tuesday – Thursday. Had to take watch Josh, take Lily to and from vacation bible school, take my mother-in-law places, and run other errands. I wouldn’t describe it as the most relaxing of vacation days. Wednesday turned out to have the nicest weather so I agreed to take Josh to Hurricane Harbor for a few hours. Even though they only opened the park at 10:30 AM, and we arrived at 10:50 AM, the park was packed! Once we managed to get passed the entrance, and stow our stuff in a locker ($15 for the day), he and I were off to try the rides. I haven’t been to Hurricane Harbor in 2 or 3 years and we only tried the lazy river and the wave pool last time. This time around Josh and I were able to try a few rides. The park isn’t that large, and plan to stand on line even on a summer Wednesday. We had to cut short our water park fun around 1:30 PM so we could get some lunch outside of the park, then drive up north to pick up Lily from VBS by 3 AM, and help my mother-in-law out with stuff. We didn’t want Lily to miss out on all the amusement park fun, so the three of us went back to Six Flags in the evening. We ended up staying until 9:30 pm, then we went home and I made mac and cheese for dinner. Thursday was a quite day. Much running around, rushing myself and the kids to vacation bible school, karate class, and orthodontic appointments. I was certainly glad when my wife got home that night. 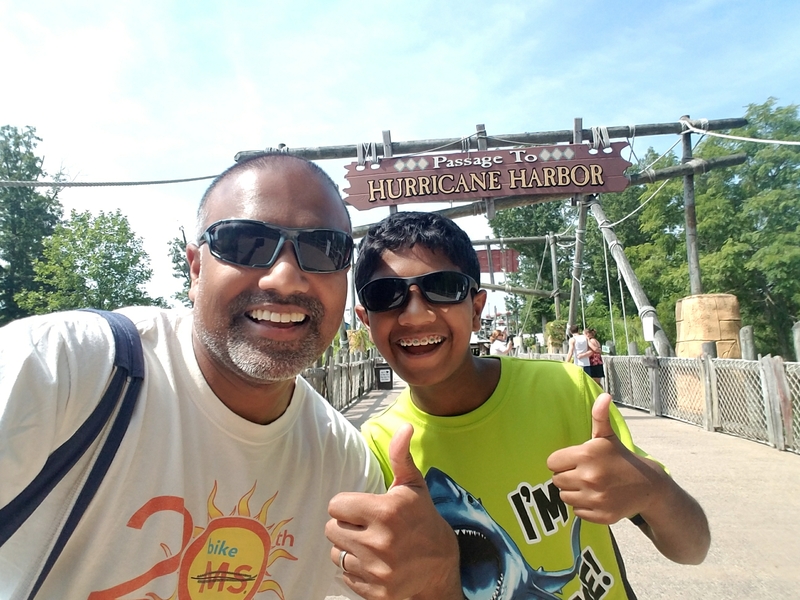 This entry was posted in Family and tagged austin, great adventure, hurricane harbor, namita, orthodontic, six flags, vacation bible school, vbs. Bookmark the permalink.